Fall is hands-down my favorite season in the Wood River Valley and that is saying a lot. I love the shoulder-season feel in town when you can again wave at the driver of nearly every car you pass. I love the mineral smell of the Big Wood River when it’s low and unhurried. Most of all, I love the teardrop-shaped leaves of the aspens as they turn bright gold and light up the hills. I love the warm Indian summer days and the cool bite of autumn nights. Conventional wisdom holds that people come to Sun Valley for the winter and return because of our amazing summers. If they knew about the fall, they would never leave. Hiking is the perfect way to best enjoy everything that is so amazing about the season. Local trails wind through rustling aspen copses, along rivers and streams, and up to vistas with pretty spectacular views. It’s a meditation of sorts. The slightly jarring rhythm of putting one foot in front of the other, heel-toe, heel-toe, and the varying pattern of the breath help clear the mind. Altitude is the ultimate mind clearer, too. The famous saying painted onto the roof of Pioneer Cabin (a fabulous hike if you’re looking for one) – The Higher You Get, The Higher You Get – is a self-evident truth. Standing atop a mountain summit, you can’t help but find some peace. On every day that the sun is shining and promising to warm up mornings that have turned nippy, I lace up my hiking shoes and hit the trails, even if it’s only for an hour. That is one of the joys of this time of year, even popular in-town hikes are extremely peaceful. The quickest option is to hike the White Clouds Trail System right across from the Sun Valley Lodge. Even though it’s a stone’s throw away, this is a really nice hike with some really nice views. You can choose to stay relatively flat or to get your heart rate going by taking the steeper routes. No matter what, it’s a good workout without a big time commitment. This is a favorite of locals following school drop off! Also very close to home is Proctor Mountain, the home of America’s first chairlift. Like the White Clouds, numerous trails crisscross this mountain providing many options no matter your fitness level or time restraints. Feeling ambitious? The Rudd Trail that runs beneath the Proctor chair lift is up, up, and up. The Proctor Mountain Loop offers many more switchbacks and a more leisurely, though not easy hike. Looking for something a bit flatter, more of a walk? The Aspen Loop is pretty gentle and involves flat sections through meadows. In the fall, I like to start my hikes at the Ernest Hemingway Memorial east of the Sun Valley Lodge and before you reach Trail Creek Cabin. 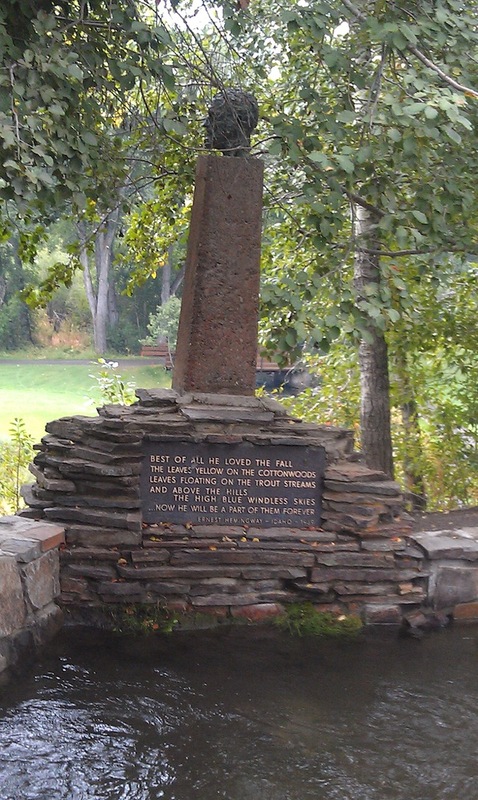 A small outdoor amphitheater overlooks Trail Creek and a monument to the great author who spent a good deal of time in Sun Valley is the focal point. The monument is inscribed, “Best of all he loved the fall/ The leaves yellow on the Cottonwoods/Leaves Floating on the Trout Streams/And Above the Hills/ The high blue windless skies/Now he will be a part of them forever.” If you are a fan of Hemingway, or even if you’re not, it’s hard to miss the sentiment as you set out on a hike that originates from this spot. When there is already snow dusty the peaks in higher elevations, which is what we woke up to this week, other local likes like Chocolate Gulch, Fox Creek, Adams Gulch are also perfect fall options. All located close to town, these are actually a system of trails that intersect and run into each other. You could literally hike for days on these well-maintained and beautiful trails north of Ketchum on the west side of the highway. If you prefer your backcountry experience on two wheels, the mountain biking in the fall is pretty spectacular, too. Again, in-town rides are the way to go as the weather changes and options are available for every level of rider. Check in with the pros at Pete Lane’s in the Sun Valley Village for recommendations and advice. The skies are bluebird, autumn leaves shimmer gold, red, and orange. The air smells crisp and fresh and morning temperatures put a spring in your step. It’s autumn in Sun Valley. Now is the time to get on the trails, turn your face to the sun, and walk or ride on a carpet of soft yellow. It’s also time to take to the local trout streams where the fly fishing is fantastic. No matter what you choose, just get outside. As wonderful as fall is, it doesn’t last long!